Deciding on the theme, decor, and style of an 18th birthday party can be tough. They may still be your kid, but this is their debut into adulthood, and it is time to transition to a party that is a little more grown-up. There’s a formula for doing young child birthday parties: a few party games, some cake, and a few goodie bags usually do the trick. But an 18th birthday is something special. Your teen is taking their first steps into adulthood and will probably want a party to match. The question is what kind of party do you want to throw? How do you incorporate their friends into the celebration? And what on earth do you put in an 18-year-old’s goody bag? No worries. Teenagers don’t need goody bags, although if your heart is set on treat bags, a $5 iTunes or Starbucks card, and some Hershey’s kisses will do nicely. However, an 18th birthday offers all sorts of more grown-up party possibilities. Unless you are going the surprise party route, be sure to clear your plans with your child and involve them in the planning. 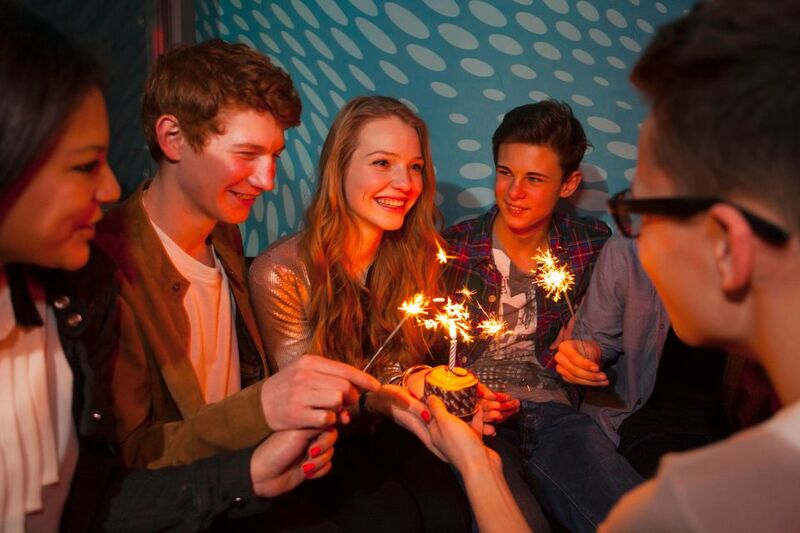 Here are some fun 18th birthday party possibilities to help get your creativity going. A surprise party is always a fun and relatively easy option. The trick is keeping it a surprise! Enlist the help of a couple of your child’s friends to assemble a great guest list, choose a location, and get your child to the designated location at the appointed time. You can keep it simple but might want to throw together a taco bar or panini buffet to make the party a little more special. No, this is not the old “find a clothespin and a green Lego” type of hunt. This is the kind Stanford’s freshmen run every fall during the campus' welcome week. In the Stanford version, students fan out across San Francisco with cameras and a list of quirky, hilarious, and often edgy items to “capture” and bring back. You can use your town's landmarks and icons to throw a wildly whimsical scavenger hunt party that will be remembered for years. Like "Harry Potter," Suzanne Collins' incredibly popular "Hunger Games" series is a crossover hit. Even Hollywood celebrities are throwing "Hunger Games"-themed parties to celebrate their 30th birthdays. With the right planning, this can be a very memorable outdoor party. An outdoor movie night gives an 18th birthday party or college gathering an extra twist. Add a swimming pool, inner tubes, and some campy shark movies along with birthday snacks and you have a recipe for a great time. If sharks aren't your child's thing choose a theme that matches their favorite film. Remember those bouncy houses from childhood? Put a spin on inflatable games by including laser tag and a gigantic obstacle course. It offers plenty of grown-up appeal and an abundance of "wow" factor. One caveat: do not hold a party of this type on a breezy day. Also, make sure you hire party rental company staff to install and adequately tether the structures and to supervise them throughout the event. The tale of Harry Potter has such enduring appeal. Young adults take the books to college and play Quidditch in the quad, and more than 400 universities have intramural quidditch teams. The trick is taking the Harry Potter birthday idea and giving it a more collegiate spin. College kids, teens, and 20-somethings are huge fans of these high-tech, outdoor treasure hunts. Geocaching uses GPS coordinates and smartphones to locate hidden caches on college campuses, wilderness trails, and urban plazas. Add some party prop-filled caches and a very cool forest picnic into the mix for an unforgettable celebration. Got a zombie fan? Zombie tag or Humans vs. Zombies is an incredibly popular game on college campuses, where the race can last for days. Depending on how you structure it, you can run an outrageous game of zombie tag in just a few hours and still have time for cake and maybe a screening of "Zombieland." Host a Settlers of Catan-themed party, and the activities take care of themselves. Gameplay, cool decor and lots of fantastic food can be inspired by those iconic hexagonal tiles. Not a Catan fan? Host an Apples-to-Apples tournament, Quelf extravaganza, or retro game fest instead. You can also throw a gigantic games party with a Twister board for 50 or play Monopoly where the players are the pieces. Grab a couple of your teen’s closest friends and catch a baseball game or a show. Hit the beach, go river rafting, or book a cooking-for-college class at a local kitchen boutique. If you go the ball game route, be sure to arrange for a happy birthday message on the scoreboard! It is a moment of embarrassment that they will appreciate and never forget. A pricier, but luxe party option involves renting a limousine for a couple of hours. This idea has particular appeal to teenage girls who like the idea of a glamorous, dressed up night on the town. They can tour the city, snap glamorous photos of each other, and grab dinner at a teen-pleasing restaurant like the Cheesecake Factory, a favorite with the prom crowd. This birthday party idea is particularly lovely for a family dinner. A few weeks before the big birthday, take a large scrapbook apart. Remove the heavy pages and send one to each member of your extended family and other important people in your child’s life. Ask them to share their best life advice and any photos they’d like to include for the newest adult member of the family. Present the bound scrapbook at the birthday dinner and read the pages aloud. Afterward, bring on the frosting swirls, ice cream and, of course, the gifts.